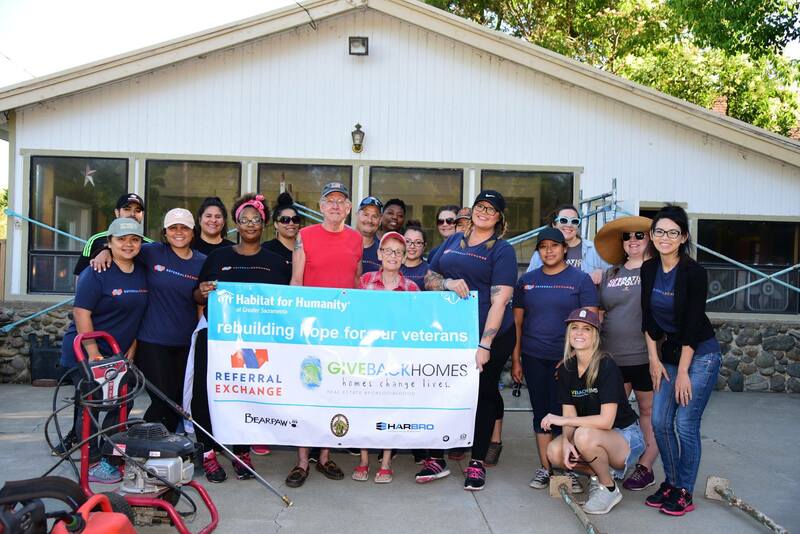 ReferralExchange brought out 80 employees to volunteer over the span of four days to help transform the home of a local Veteran and his wife. Glenn is a navy veteran who fought in Vietnam, and Joanne is a retired nurse practitioner who is gearing up for her 23rd surgery, this time to replace her knee. The couple has lived in this house (that Joanne’s grandfather built) for 5 generations. Joanne grew up next door and would tell us stories of when she was a kid living on the property. From square dancing, to Christmas pageants, it all went down here for their family. The Claghorn’s are getting a new roof and a fresh paint job on the home that’s housed so many memories for them. The volunteers helped tear off the old roof, and repair dry rot before replacing the shingles and giving the home some fresh paint. These repairs will allow Glenn and Joanne to stay in their home and solve their leaking roof problem, so they can focus on their health. Both Fox40 and Good Day Sacramento stopped by the build site to check on the progess. Thanks to ReferralExchange’s generous donation and army of volunteers, the Claghorn’s are ready for the rain with their new and improved roof. Want to support impactful projects like this? Check out the Giveback Homes build page to donate to an affordable housing project benefiting families in need both here in the U.S. and around the world.